TTG: Madly and Love is a bit of an unusual name – what made you pick it? HF: From a conversation my husband and I had when we were still dating and extremely, or some would say, “madly” in love. In his former days, my husband had served as an officiant for his friends, and I thought I was a genius at planning events, so played around with starting a business as wedding planners – we’d call ourselves “Madly and Love” – like a law firm. 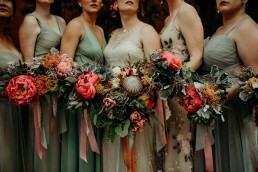 We never became wedding planners, but when I started my floral adventure it just seemed right. 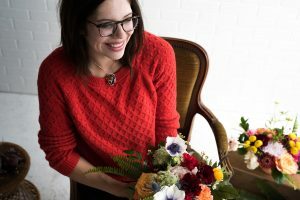 TTG: What made you realize you wanted to create a business as a floral designer? How do you keep learning and growing? HF: For me, my love for flowers started out on the farm I grew up on and became a bit of an obsession when I observed florists in New York City, where I lived after college. The world has changed where education is concerned. Now you can learn practically anything on YouTube or Instagram Live. I watched free tutorials a lot when I was first starting out, but now I buy online courses when there is a particular skill or new challenge that I would like to tackle. I love supporting colleagues in the industry and if you look closely, you find that no one does it the same and everyone has something they can teach! TTG: What plants or colors do you most tend to gravitate to? HF: I gravitate toward the exotic and love finding unexpected textures and blooms for anything I create. If it’s weird, I want it! Currently, there is a real passion in the floral world for neutrals, browns, caramel, and every dried bit of anything you can find. Although my aesthetic has been driven by bright, fun colors in the past, I am finding myself loving a sun-bleached, muted palette right now. HF: This is a very hard question! I’ve made so many things in the past 4 years of creating. Usually, the most memorable are the items I design for the styled shoots I organized. In the industry, styled shoots are a way for vendors to come together and showcase their work. It’s a way to do what I want and not what I am being asked to design by a client. 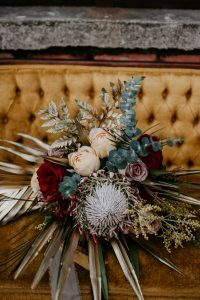 For my first styled shoot, I spray painted a lot of foliage an antique gold, and for my more recent styled shoots, I played with dried foliage and tropical blooms. Like I said, I love the unusual and I gravitate toward opportunities that let me try things. I don’t always love the outcome, but I find that I grow much more as a florist taking risks than being careful in my approach!